* We can custom design this tour for you. In untouristed little towns in Sicily, feel part of authentic local life in rich, truly one-of-a-kind cooking, wine and walking experiences with a cast of local people, passionate about sharing their food, culture and lives with you. Cook, drink, eat and explore in Linguaglossa (pop. about 5000) in the unique Mount Etna foothills in private, insider visits in families’ homes, restaurant kitchens and wine cellars. Discover breathtaking natural beauty as you walk along paths near Mount Etna and on the exotic, remote, volcanic Aeolian island of Stromboli (pop. about 500). As you dine on a patio overlooking the sea, marvel at Stromboli’s live volcano hurling its fire into the night sky. An extraordinary series of enriching, local lifestyle and nature experiences! 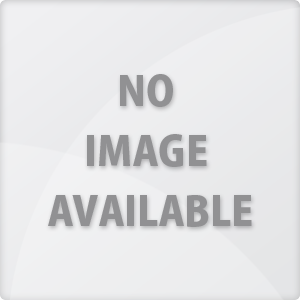 Description: Arrive in Catania airport. Private transfer to a four star hotel in the heart of little Linguaglossa in Etna’s foothills. The 18th century palazzo, formerly a noble family’s home, was transformed into a hotel with historic touches and comfortable, fun, minimalist style rooms. 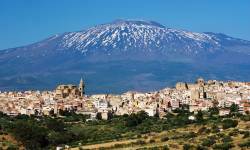 Easy to step out and explore this typical Sicilian mountain town and taste local life. Description: Abundant continental breakfast at the hotel every morning. The hotel owners have a bakery so you enjoy heavenly, fresh pastries and breads. Optional walk about 3 hours in Mount Etna’s exotic foothills on black volcanic sand paths and craters punctuated with green and gold trees overlooking the blue sea. Or stay in Linguaglossa and pamper yourself in the hotel’s spa or explore Linguaglossa, full of interesting murals and good cafes stuffed with tempting Sicilian cookies and cakes. At a winery in the hills, a local family makes excellent Etna wines. They show you around the estate and taste their wines with you. At the winery, savour a light lunch with their wines. Cook local seafood dishes in a class in a hillside restaurant with the effervescent owner and his friendly, knowledgeable chef son. Enjoy your creations with good Etna wines. Description: Explore Taormina with a local guide and wonderful storyteller with a vast knowledge of history and local lore. Discover fascinating layers of history at the amazing Greek theatre with spectacular views of Mount Etna and the sea. Pop into alluring bakeries full of Sicilian almond, orange or pistachio cookies, cannoli and marzipan. Lunch is on your own. 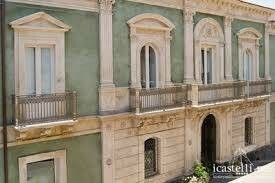 In Linguaglossa walk from your hotel to a charming family’s home for an authentic Sicilian experience. They grow vegetables, olives, hazelnuts and have vineyards and sheep. The joyful, outgoing mother makes cheeses, salami, bread, and preserves like dried tomatoes. Make local maccheroni, watch how to make tomato sugo and other genuine local dishes with the mother in her kitchen. Around their dining table with their family, eat your creations with their wine. Description: Leave your hotel at dawn, catch the 8:30 a.m. boat in Milazzo to arrive for lunch at the island of Stromboli in the Aeolian Islands. Walk along the sea front and check into a pretty three star hotel on the beach, surrounded by gardens and with amazing views of the black sand and blue sea. Free time to explore the town, its white buildings and lush gardens along quaint streets too narrow for cars, or laze on the black sand beach, taking dips in the clear blue sea. Lunch is on your own. In the late afternoon, enjoy your hands-on cooking class in a family’s home and dine on your efforts at their table. Description: Free morning to laze at the beach, wander the picturesque streets, browse in shops or relax in the piazza high up in the town with views of the port and neighborhoods. Enjoy lunch on your own. 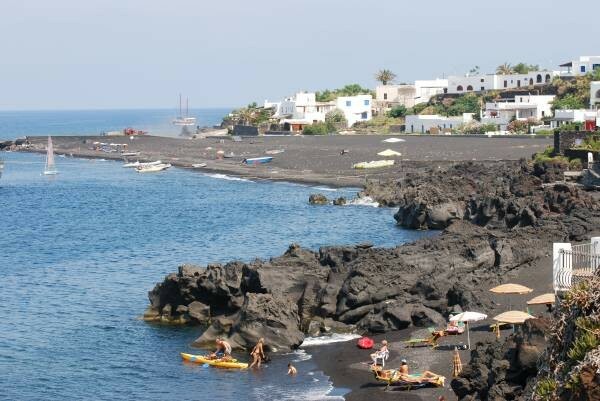 In the afternoon take an optional, fascinating 2 hour boat trip around Stromboli. Stop to walk in Ginostra, home to 27 residents who got electricity about 7 years ago. Re-board the boat to view the steep, black hillside where volcanic fire and rocks run down from the crater to the sea. In the late afternoon, hike along or up Stromboli. Choose from three different levels of hikes. In choices 2 and 3, dine after the hike/ride on the outdoor terrace of a rustic restaurant set high above the sea. Arrive before sunset so you watch the sun set over the sea, as you sip a cool drink. As darkness falls and you enjoy dinner, the volcano hurls its fire into the night sky in a spectacular show. Choice 1: Challenging hike for about 5 hours up and down a 45-degree hill to the craters at the top at 900 metres—amazing views. Descend in the dark with your lights in loose volcanic sand and rock. Dine and celebrate in the piazza on your return. Choice 2: Intermediate level 2-3 hour hike up to 400 metres along the mountainside in daylight with steps up and down about half the time and magnificent views. Choice 3: Walk leisurely or take a taxi up a stone road in daylight for about an hour to the restaurant for dinner. Walk back to town with flashlights to light your way or take a taxi down the same road. Description: Leave Stromboli by boat for Milazzo on Sicily’s mainland. Private transport to your Linguaglossa friends’ 4 star hotel where they welcome you home. Lunch on your own. Free time to relax. In late afternoon, learn about Sicilian nouvelle cuisine made with fresh, local ingredients in a hands-on cooking class with the chef in your 4 star hotel’s restaurant. Divine food! Description: After breakfast, depart for Catania airport. Hotel in historic palazzo, beautifully renovated. Public areas have historic & modern decor. Rooms are chic modern design. Locally owned & run. Family owns a bakery so breakfast is very good & fresh! Friendly, attentive service. Excellent restaurant with creative Sicilian dishes. Located right in town so you can step out & explore. in business since 1949 when Ingrid Bergmann made the movie, Stromboli. 37 rooms, 80% with sea views. Right on the sea with private black volcanic sand beach. Terraces, two restaurants, gardens. Decor is basic with old fashioned feel. About 900 metres from the port--they take your baggage for you. 400 metres to walk up to the town centre. 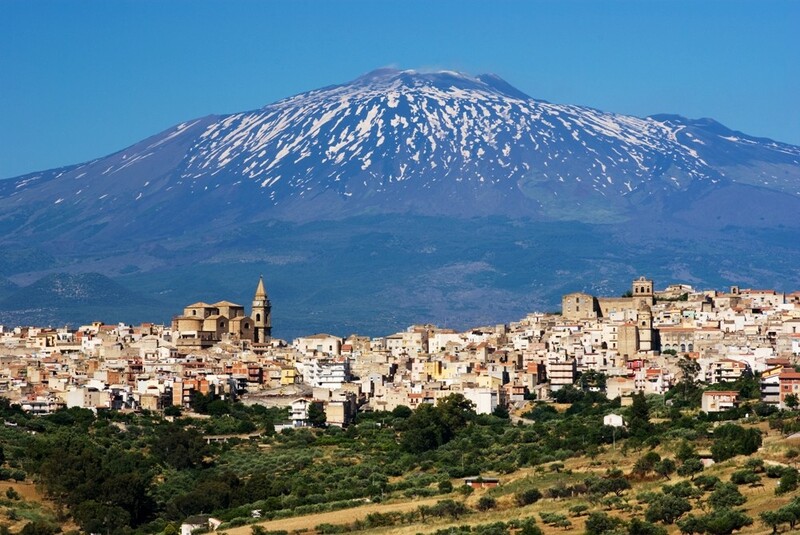 Sicily's greatest natural attraction is also its highest mountain. To the ancient Greeks, Mount Etna was the realm of Vulcan, god of fire, and the home of the one-eyed monster known as the Cyclops. At approximately 3350 meters, it is Europe's highest active volcano. The height of its summit changes with each eruption, and over the centuries a few lava flows have reached the coast. Over 1200 square meters of Etna's surface is covered with solidified lava. Etna offers skiing in the Winter months and breathtaking hikes in the woods during the Summer. There are also a number of smaller peaks on the slopes of Etna, and some interesting caverns. Since Etna is a strato volcano, with relatively cool lava temperatures and numerous openings (vents), nobody ever knows precisely where on its vast surface the next eruption will be. Etna's long recorded history has proven invaluable to geologists around the world.